Self Guided Escapes — Pura Vida Travel Co. Pioneers of ecotourism in Central America, Costa Ricans take pride in sharing their breathtaking landscapes, diverse wildlife, and smiling faces with visitors from across the globe. Combined with unique activities that engage and immerse visitors in this world of natural wonders, Costa Rica truly offers something for everyone from awe inspiring volcanoes and lush tropical rainforest to majestic waterfalls and postcard worthy beaches. 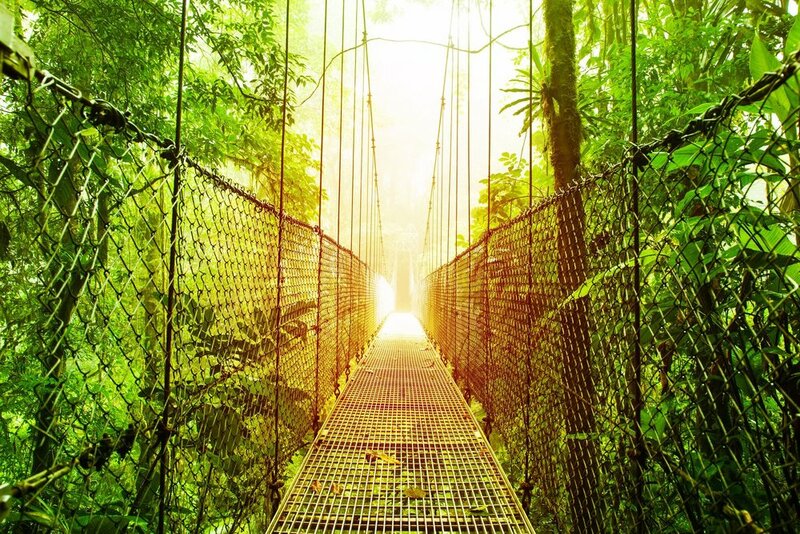 With so much to do and see, planning the perfect escape in Costa Rica can be overwhelming. Fortunately, we've done you a favor and created an itinerary that highlights the very best this amazing country has to offer. Read on and discover why Costa Rica is our flagship destination for travel in Central America. Guided hike through Monteverde Cloud Forest Reserve with naturalist guide. 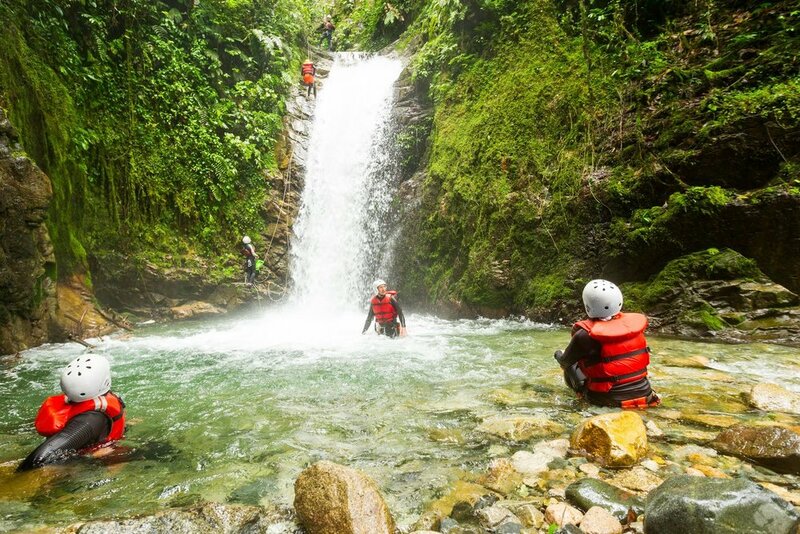 Choice of canopy zip lining, white water rafting, or waterfall repelling in La Fortuna. *based on double occupancy. rates subject to change. Thank you for reaching out. A representative will reply to your request within 24 hours! Indulge in Costa Rica's Caribbean flavors on this journey into an often overlooked paradise of pristine beaches, tropical rainforest, and vibrant culture. From Puerto Viejo to Manzanillo, the small laid back beach towns offer up a variety of activities reminiscent of 'island life on the mainland' from snorkeling and surfing to sipping tropical drinks on unspoiled beaches. Backed by lush tropical rainforest, this coastal destination is home to variety of wildlife including sloths, monkeys, turtles, toucans, and scarlet macaws. One of the last remaining places where Costa Rica's indigenous people, the Bribri are found, the region is unique blend of afro-caribbean, spanish, and indigenous culture infused with a like-minded spirit of oneness with the surrounding landscape. Harness the energy and feel the vibes of this captivating location with a six day escape to el caribe. Enjoy one or more of the many optional tours and activities offered in the region including snorkeling, dolphin watching, turtle observation, canopy zip-lining, and indigenous village experiences. We highly recommend a guided hike of Gandoca-Manzanillo National Wildlife Refuge for even more opportunities to enjoy the abundance of wildlife in the region within its natural and unspoiled habitat. Don't forget to grab lunch at Maxi's for one of the best Caribbean style meals of whole fish and rive & beans in coconut milk you will have during your stay. Travel Expertise - We take pride in knowing our destinations inside and out to provide you with information that is current and accurate prior to traveling. Much of the information we provide comes from first hand experience as we have traveled, lived, and worked in many if not all of the destinations we offer. We've established long lasting relationships with people in the communities that will host you during your stay, contributing to the wealth of knowledge we have access to on a daily basis. Our passion for these destinations and our desire to share a slightly different side of travel drives our committment to preparation so that we feel confident in your meeting all your travel expectations. 5 nights accommodation at Hotel Banana Azul, La Costa de Papito, Shawanda Lodge or 3 star equivalent. Day 1 - Arrive in San Jose by early afternoon where your friendly driver will greet you at the airport and load your luggage in preparation for your drive to the coast. Travel through the impressive central highlands giving way to the lowlands of the Costa Rica's majestic Caribbean Coast and arrive at your hotel in time for a welcome drink and and picturesque sunset before dinner and bed. Day 2 - After breakfast head to Playa Cocles for a morning yoga class or surf lesson. Spend the remainder of the day enjoying the radiant sun, soft sands, and gentle waves of this popular beach. After lunch, enjoy a massage or body treatment at the local spa or relax in a hammock outside your hotel room. Venture into town for dinner and drinks before a night of dancing at one of the popular beachside bars. 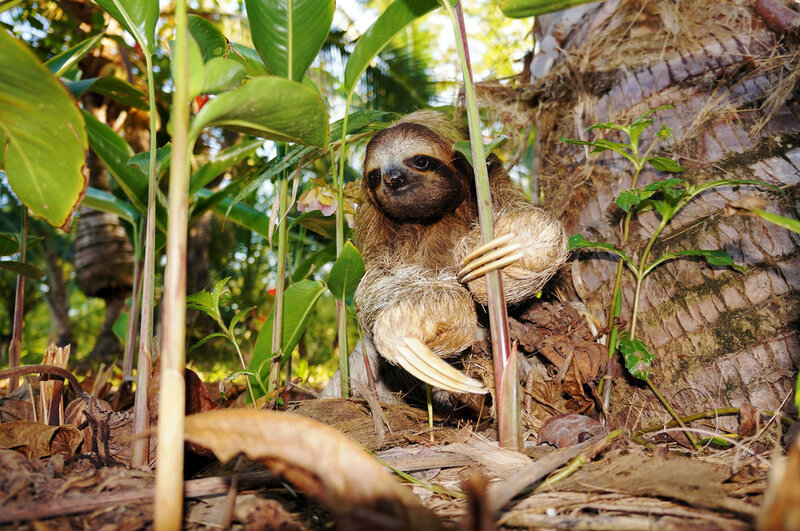 Day 3 - Depart in the morning for your 3 in 1 tour with a visit to the sloth sanctuary for an up close and personal experience with these local inhabitants of the rainforest. Afterwards visit a local chocolate farm to learn about the origins, productions, and cultural importance of this delectable treat. After lunch, take a guided hike of Cahuita National Park for opportunities to see howler monkeys, sloths, tropical birds, reptiles and insects before swimming in the refreshing turquoise blue waters bordering the park's beautiful white sand beaches. Day 4 - Rent a bike and head south down the road in search of some of the best beaches Costa Rica has to offer. Follow gravel roads and jungle trails giving way to stretches of empty pristine coastline. Don't miss Punta Uva, our favorite of these hidden gems along this route. Day 5 - Enjoy one or more of the many optional tours and activities offered in the region including snorkeling, dolphin watching, turtle observation, canopy zip-lining, and indigenous village experiences. We highly recommend a guided hike of Gandoca-Manzanillo National Wildlife Refuge for even more opportunities to enjoy the abundance of wildlife in the region within its natural and unspoiled habitat. Don't forget to grab lunch at Maxi's for one of the best Caribbean style meals of whole fish and rive & beans in coconut milk you will have during your stay. Day 6 - Transportation will meet you early in the morning to take you back to San Jose in time for your departure flight home. Say your final goodbyes to this new found paradise and your gracious hosts before taking off with memories to last until your next great escape! Simply fill out the form below and a representative from Escapitos will provide you with a personalized quote today! a 3 night version of this escape is available and ideal for passengers traveling from Tortugeuro (or San Jose) en route to Bocas del Toro Panama. self drive/car rental option available. Puerto Viejo de Talamanca and neighboring towns of Hone Creek, Cahuita, Cocles, Chiquita, Puna Uva, and Manzanillo make up what we call Costa Rica's 'Caribbean coast'. While the port city of Limon and popular destination of Tortuguero are also situated on the same coastline they are located farther north and for this reason are generally excluded from our discussion of this particular region. Puerto Viejo is a 4 hour drive from the capital of San Jose. With essentially only one road leading to the coast, you must first travel north through the Braulio Carrillo National Park with its expansive and sweeping views of Caribbean lowlands visible from winding road passing through this virgin cloud forest. Patience is a must along the scenic two (sometimes three) lane highway shared with trucks carrying goods to and from Limon. As you pass through the port city and round the bend heading due south towards Puerto Viejo, its hard to miss the massive tankers dwarfed by the Caribbean Sea lying in wait off the coast. The last part of your journey takes you into the heart of the Caribbean as the road moves past beaches, along rainforest, and through banana plantations en route to your final destination. Hotels on this escape are located 'on the road to' or just outside of Puerto Viejo proper. Like most lodging options offered by Escapitos we have selected these hotels based on the unique experience provided as well as their commitment to sustainable tourism. These particular hotels are removed from the center of town, surrounded by the Caribbean rainforest, and just a few steps from the best beaches in the region offering guests a truly immersive experience in nature. Imagine waking to the sounds of tropical birds and sites of howler monkeys in the trees right outside your room before spotting a sloth on your way to hotel reception. We're confident you won't mind a short walk or bike ride to restaurants, shops, and tour providers reminding you that you're never too far from civilization! Be sure to check out our reviews of hotels included on this escape for additional orientation before traveling. 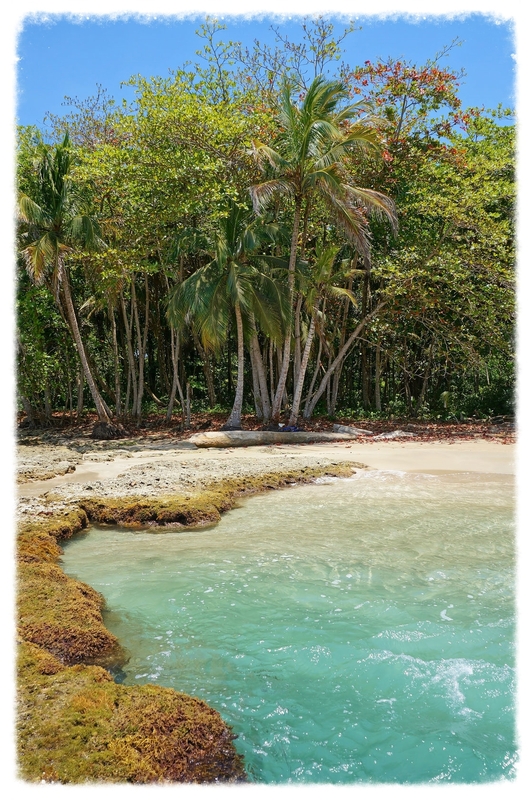 The Caribbean coast of Costa Rica harbors Cahuita National Park and Gandoca Manzanillo Wildlife Refuge. Most of the wildlife you see in and around Puerto Viejo, Cocles, Playa Chiquita and Punta Uva is an extension of these two protected areas. Cahuita offers and excellent intro to wildlife in the region with its soft sand trails winding in and out of rainforest and pristine beach, while Gandoca Manzanillo is recommended for travelers seeking to go a little farther and harder in exchange for the reward of coveted wildlife sitings and spectacular views of Costa Rica's southern coastline. Wherever your may go during your stay, keep your eyes and ears open (mostly towards the trees); be still and wait for nature's magical moments to unfold before you. We encourage all travelers to participate in tours and activities that support local economies and celebrate indigenous culture. Located about 15-20 from Puerto Viejo, The Kekoldi Indigenous Reserve is home to the Bribri. Take a village tour and observe their green Iguana project before lunch and a hike to a hidden waterfall. You may also choose to support organizations like ATEC, who promote sustainable tourism by hiring local guides for tours, coordinating volunteer activities, and providing conservation education for travelers and local residents alike. Check with your Escapitos representative for more information about ways in which to make your escape even more sustainable! The place where land meets sea has and will forever be one of intrigue, mystery, and wonder as we seek to explain the unexplainable wonders of nature that occur in our coastal ecosystems. Once known for its harbor seeking pirates and imperial invaders, the warm water and soft sands of the Caribbean are now home to migrating waterfowl, mysterious sea turtles, and playful monkeys. Navigate the winding waterways of Tortuguero, wander empty stretches of pristine beach near Puerto Viejo, and dance the night away over the emerald waters of Bocas del Toro on this unique itinerary combining two of Central America's popular destinations into one unforgettable travel experience. A combination of countries that currently champion the art of sustainable tourism, Costa Rica and Panama highlight the ways in which we can learn to live in harmony amongst nature's wonders. The people and places you'll encounter on this journey carry an energy that may best be described as 'good vibes', transferred from host to guest, nature to observer as you pass through these magical lands. Airport transfers & ground transportation between San Jose, Tortuguero, Puerto Viejo, and Bocas del Toro. Airport departure tax and border fees. Day 2 - Wake up early and get a head start on the day with one of many activities highlighting the region's natural beauty. Hike or travel by horseback to La Fortuna Waterfall for a swim in the refreshing turquoise blue waters below the majestic jungle falls or take a guide hike of Arenal Volcano observing the unique landscape and wildlife surrounding which was was until recently, one of the most active volcanoes in the world. Take the afternoon to relax in the natural hot springs of La Fortuna and Arenal, heated by the lava lying within the sleeping giant or stop by Proyecto Asis to observe and support their rehabilitation efforts for wildlife in the region. Day 3 - La Fortuna is known for its adventure based ecotourism and you won't want to leave without feeling the rush, adrenaline, and natural highs of Arenal. Soar among the tree tops with canopy zip lining, rappel down jungle waterfalls into crystalline pools at the bottom of lost canyons, or navigate world class II, III & IV rapids with an exhilarating and heart-pounding day of white water rafting. Mountain biking, kitesurfing, and stand up paddle boarding are also available in and around tranquil Lake Arenal. Day 4 - Depart for Monteverde as you ascend further into the western highlands. Arrive by midday in time for lunch at the local bakery followed by a coffee tasting tour highlighting the local industry and its importance to the regional economy and national culture. After dinner take advantage of a night hike through the fabled cloud forest of Monteverde. Lead by your naturalist guide, this unique experience affords opportunities to see frogs, snakes, spiders, sleeping birds, sloths, and even a kinkajou if you're lucky! Day 5 - As the sun rises on another day in paradise, continue your exploration of the region with a hike through the Monteverde Cloud Forest Reserve. Monteverde harbors over 2,500 species of plants, nearly 500 of which are orchids, 400 species of birds, including 40 hummingbird species, more than 1,000 amphibians and reptiles, ten s of thousands of insect species as well as more than 100 species of mammals including deer, coatis, sloth, tap, howler and capuchin monkeys as well as all five big cats native to Costa Rica; a nature lover's dream. Naturalist guides in the region are world-renowned for their ability to locate, identify, and educate visitors on a variety of flora and fauna found in these enchanted forests. Day 6 -Enjoy a typical Costa Rican breakfast before setting out for Manuel Antonio National Park. 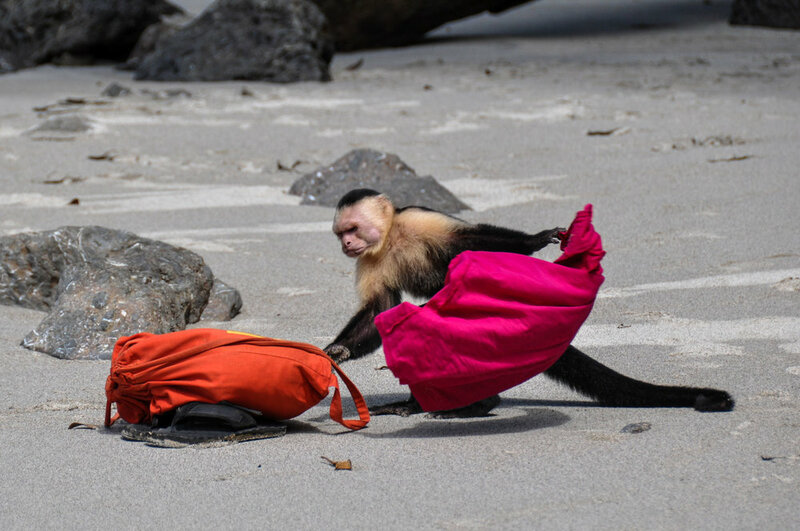 Don't forget your camera as well as your bathing suit as the park is home to variety wildlife most famously its resident monkeys, sloths, and iguanas as well as postcard worthy beaches to enjoy following your hike. Wildlife within the park can be seen with relative ease and we encourage visitors to explore and interact with this natural world at their own pace rather than follow a large group on a guided tour. Pack a lunch and make a day of the your experience in the park, relaxing on the soft champagne sands as sparkling blue waves find their way around impressive rock formations on their way to the beach. As the day comes to a close take in an unforgettable sunset while dining on some of the best seafood in the region. Day 7 - The day is free to enjoy one of many activities offered in and around Manuel Antonio. Challenge yourself with a surf lesson from local instructors, explore the mangroves and fabled Damas Island by kayak, or cast off in the afternoon for a day of sailing and snorkeling on a sunset catamaran tour. Horseback riding, scuba diving, canopy zip lining, island hopping, white water rafting, sport fishing and parasailing are also available for you to choose. Treat yourself to a massage or spa treatment in town before joining a beachside barbecue as the sun sets on your final day in paradise. Day 8 - Final goodbyes to the beach and early morning departure takes you back to San Jose arriving in time for your flight home. * Please note: This itinerary is presented as an example of how visitors might spend their time on this escape. Remember that all independent escapes can be customized according to your liking including length of stay, accommodations, and activities. Each experience is essentially unique to the traveler. Nosara remains the quintessential destination for yoga travelers seeking free their mind, find balance, and have a little fun in nature along the way. Nestled between postcard worthy beaches and enchanting rainforest Nosara provides the ideal backdrop for your next yoga vacation. Enjoy carefully selected sustainable lodging during your stay offering resident yoga instructors, healthy fresh 'farm to table' meals, and easy access to the top attractions in and around Nosara. While slightly shorter in duration, this trip provides a deep breath of fresh air for those feeling suffocated by life back home. Escape the hustle and bustle of your daily grind and immerse yourself in the peace and tranquility of nature. Whether its a morning paddle board yoga session or bearing witness to a mass gathering of nesting sea turtles each day provides a plethora of opportunities to connect with nature while finding your center. 4 nights accommodation at one of our choice lodges in Nosara, Costa Rica. round trip ground transportation between your hotel in Nosara and international airport in Liberia or San Jose. Day 1 - Arrive in either Liberia or San Jose as you are greeted by private transportation outside the airport. After a scenic drive through the central highlands and out towards the Pacific you arrive in Nosara nestled along the coast of the Nicoya Peninsula. 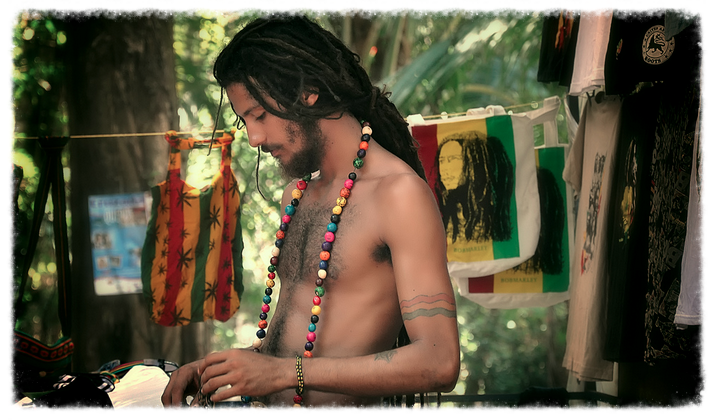 With a laid back vibe and plenty of positive energy to go around, the community of Nosara welcomes you to paradise as the sun sets on your first day. Day 2 - Wake to the sites and sounds of the natural world around you followed by a breakfast of fresh fruits from the local landscape. Prepare your mind and body for the day ahead with yoga in the hotel pavilion before relaxing in the sun, sand, and waves of Guiones beach. As the day draws to a close take a stand up paddle board out to sea, gliding along the horizon with glassy ocean reflecting spectaxular hues of red, orange, and purple from the setting sun. Day 3 - Participate in a sunrise yoga session before breakfast. An optional kayaking tour along Nosara's unique system of rivers and mangroves provides opportunities to see waterfowl, turtles, and caymen. After a healthy organic lunch head out for a hike in the rainforest surrounding the hotel or back to the beach for a walk on the sand. Day 5 - Thank nature for its blessings as you say your final goodbyes to the rainforest and beaches of this magical place. Private transportation will take you back to the airport in time for your return flight home. Explore magical waters surrounding post card worthy islands off the coast of this often overlooked gem of the Caribbean. Belize invites visitors to return to the sea in search of playful fish, graceful rays, and curious turtles before relaxing in hammocks strung between palms set along white sand beaches. The sparkling sea eventually gives way to lush tropical rain forest of the mainland. Venture within to discover the mystery and wonder of an ancient Maya civilization revealed through the ruins protected by the forest. We invite you to embark on this unforgettable journey complete with an overnight sailing excursion exploring remote islands and tropical reefs teeming with colorful marine life and exploration of ancient ruins. Discover the the rich history and vibrant culture of Caye Caulker and the Cayo district bearing witness to authentic Caribbean cuisine, picturesque sunsets, and a welcoming community proud to share the paradise they call home. 6 nights accommodation at one of our select hotels on Ambergris Caye. Round trip ground and water transportation between Belize City, San Pedro, and San Ignacio. Day 1 - Arrive in Belize City and meet your private transportation outside of the International Airport. A short drive brings you to the water taxi station where you will board the next boat destined for Ambergris Caye. Feel the warm Caribbean air cooled to a refreshing ocean breeze as the boat cuts through the calm turquoise waters of the sea. You boat arrives in San Pedro in time to check into your hotel and grab dinner on the town as sunset brings your first day in paradise to a close. Day 2 - After a Caribbean style breakfast, set sail for a day of spectacular snorkeling in the Hol Chan Marine Reserve. Located five miles south of the island, this natural aquarium provides unforgettable opportunities to observe vibrant colorful fish like royal fairy basslets, parrot fish, trigger fish, and blue tangs (Dory from Finding Nemo) as well as larger fish like grouper, barracuda, and even moral eels! With shallow waters and premium visibility Hol Chan Marine Reserve allows you to explore the reef in all its natural wonder with iridescent sponges, sea fans, various corals contributing to the biodiversity of marine life in this unique location. Continue on to Shark Ray Alley to explore the shallow waters that live up to their name. Swim alongside giant mantas and play with gentle nurse sharks, an experience not to be soon forgotten. You may also be lucky enough to spot a curious turtle, majestic spotted eagle ray, or migrating manatee hanging out in the area! Return to San Pedro in the afternoon for lunch and free time to hang out on the beach or explore San Pedro Town before dinner. Day 3 - Take the morning to enjoy the numerous offerings of the island as you please. You won't have to go far to find an umbrella and chair on the white sands a few steps from your hotel room. Take advantage of paddle boats, sea kayaks, stand up paddle boards, and water trampoline to cool off in the crystal clear Caribbean waters. The adventurous traveler may opt for kitesurfing offshore or diving at the world renowned Blue Hole. After lunch climb aboard a catamaran for an optional sunset sailing cruise. Enjoy snorkeling along the reef before rum punch and post card worthy views back on the boat. Arrive at the dock in time for a belizean style beach barbeque complete with fresh caught lobster, fish, chicken, rice, and beans! End your night with dancing in town, a stroll on the beach, or at the end of the docks under the Caribbean night's sky. Day 4 - Leaving the islands behind your water taxi departs for Belize City and the adventure of the Maya mainland. Private transportation takes you over land towards the capital of Belmopan via the Hummingbird Highway. 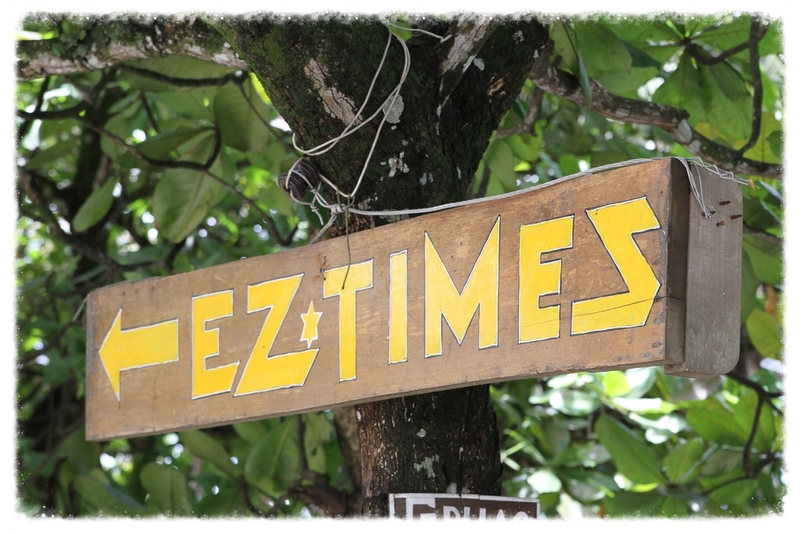 Arrive at your ecolodge nestled in the lush tropical rainforest of central Belize by late afternoon. Settle in, take a tour of the grounds or hang out by the pool before dinner. After sunset, explore another wild side of the rainforest with an optional night hike. Equipped with headlamps, follow your guide in search of monkeys, sleeping birds, deer, frogs, spiders, and snakes as you explore an ecosystem that comes alive when the lights go out. Day 5 - Spend the day at your leisure with the option to Belize's unique network of caves in one of three ways: observe hanging crystal formations as you float along an underground river of caves via inner tube, ascend and pool plunge through a series of waterfalls within the caves, or explore on foot to go deep inside the same caves used by Maya Shaman as their ceremonial centers 2,000 years ago. Day 6 - Your journey continues with an early start and departure for Petén, Guatemala. After getting your passport stamped and crossing the border into Guatemala, arrive with the group at the ancient Maya ruins of Tikal around mid morning. A four hour guided tour takes you through major structures of the site including the Great Plaza, North Acropolis, Central Acropolis, Mundo Perdido (Lost World Complex), and Temple IV. Your guide shares a wealth of information regarding the archeology and history of this magical place as well as its significance to the Maya culture both past and present. After the tour you may follow a troop of monkeys, observe a curious coati, or spot tropical birds as you explore the mystic jungles ruins at your leisure befor returning to your hotel in Belize. Day 7 - After final farewells return to Belize City and the airport in time for your departure flight. Board the plane refreshed, relaxed, and ready to take on life back home after your incredible journey to this magical destination. Please check availability for your desired arrival and departure dates with an Escapitos representative before booking this trip online! please inquire for triple and quad availability as well as options and upgrade. * price per person based on double occupancy. double occupancy bookings must be accompanied by a corresponding booking (purchased separately) for friend, family member, spouse or significant other in order to complete the reservation. This itinerary can be fully customized to fit your desired travel dates, hotels, and included activities. Optional activities on this trip like scuba diving, kite surfing, rainforest night hike, and caving can be booked through us in advance or with your hotel upon arrival. Don't want to travel alone? A guided group version of this trip is available here. This trip can be booked year round with Sun-Sat departures. Begin your journey hiking through lush rainforest, exploring magnificent caves, and climbing ancient Maya ruins in Belize's Cayo district. A change of pace takes you to the country's magical islands for some of the world's best snorkeling and diving, white sands with picture perfect waters, and a laid back vibe ideal for slowing down for some serious rest and relaxation. Upon arrival at the international airport a scenic drive along the Hummingbird Highway and into Cayo District, the heart of the country, brings you to your hotel. Immersed in the lush rainforest of Belize's often overlooked and vastly unknown interior, you adventure begins as staff show you to your room and help you settle into your new surroundings. Grab a quick lunch at the hotel restaurant before an orientation and tour around the hotel grounds. Join other guests for dinner before turning in early to recover from a day of travel. Fall asleep to the sounds of the rainforest with anticipation for the next days activities carrying you into your dreams. Start the day with breakfast at the lodge before setting out on an exciting day of adventure and exploration at ATM cave. Lead by your experienced guide and equipped with headlamp, venture into these spectacular limestone structures carved out by water to create awe-inspiring underground caverns. Move slowly through the cave to gain and appreciation for the geological wonders of stalatites, stalagmites, and columns as well as the historic, cultural and sacred significance of the site for the Maya people, as explained by your guide along the way. After a long day, take the remainder of the afternoon to rest and relax around the lodge before dinner. Rise with the sun and join up with one of the Lodge’s naturalist birding guides for an early morning walk along the trails surrounding the lodge. The area is a birder's paradise with opportunities to spot all three species of toucans, the olive-throated parakeet, the golden-hooded tanager, the purple-crowned fairy and more! After breakfast set out on an exciting hike up mountainside trail covered by a rainforest canopy of jurassic palms amongst towering trees. Along the way your naturalist guide highlights the biodiversity of the land identifying trees and plants found by the ancient Maya to to aid and assist them in their daily lives, many of which we still use today. After a challenging ascent you are rewarded with a spectacular view followed by a refreshing swim in the cool waters of a natural pool found at the base of the mountain. Spend your afternoon tubing or paddle boarding along the lazy river passing in front of the lodge or grab a drink and relax in a hammock before dinner. Rise early and prepare yourself for a mind blowing visit to the ancient Maya ruins of Tikal. Located just across the border in Guatemala, these jungle ruins provide a glimpse into the world of the Maya as they lived thousands of years ago. Both original and restored limestone structures rise into the jungle canopy creating impressive views from above and a humbling perspective from the ground looking up. Keep your eyes open for toucans, spider and howler monkeys, as well as the ellusive jaguar as your bilingual guide identifies various flora and fauna along the trails between the temple sites. As you traverse the massive expanse of ruins absorb the history and culture of the Maya people, as one of the greatest cities of the ancient Maya world comes back to life through your mind's eye. Imagine Maya astronomers calculating precise locations of circling heavenly bodies from atop the pyramids or people gathered in the main plaza to observe an athletic event of Maya ballgame. Exit the jungle ruins of Tikal with a newfound understanding of the Maya and hopefully many new questions regarding this highly advance yet enigmatic and destructive civilization. T ime - we save you plenty before you trip and help you effectively manage your precious time upon arrival. O rganic - celebrating nature, yoga & options for vegetarians, our trips encourage 'green lifestyles'. S ustainability - enfused in all products to help prserve and protect the places we love for future generations. TRANSPORTATIONEscapitos is proud to be one of the only travel agencies servicing Central America to offset carbon emissions for you international flight to Costa Rica with the purchase of sustainable certificates through FONAFIFO. Whenever possible, Escapitos partners with ground transporation services that participate in carbon offset programs as well. GIVING BACKEscapitos donates $10 from each booking to the Bribri and Kekoldi indigenous communities of Costa Rica to support sustainable initiatives in education, ecology, and local economy. We are a boutique agency focused on the region of Central America, specializing in tailor made travel service. If you can dream it, we'll make it happen. Escapitos itineraries are uniqe, thoughtfully planned, and exciting! Forget those cookie cutter vacations offered by other agencies. Our travel expertise is based on first hand experience living and working in the places you'll visit. All Escapitos products are infused with sustainability as we share in the responsibility of preserving and protecting these magical destinations. Attention to detail and a commitment to excellence, with an emphasis on customer service and satisfaction. We're not happy unless you are. It brings us great joy to connect you to the people and places we have a passion for. Quite simply, we love what we do.